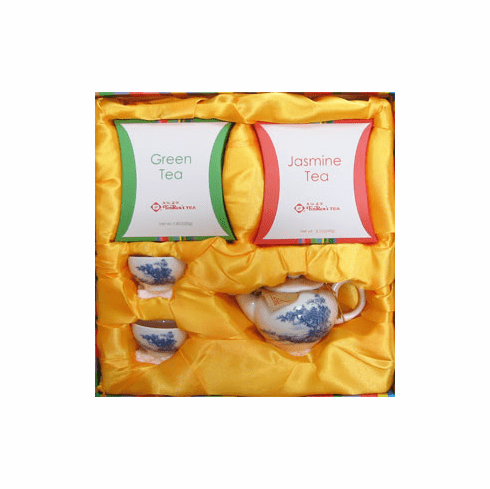 The gift set includes 1.8 ounces (50g) of fine quality green tea and 2.1 ounces (60g) of fine quality jasmine tea. Completing the set is one teapot and two teacups. Both are made of glazed ceramic decorated with stylized bonsai trees. The set is enclosed in a bright and colorful gift box making this the perfect gift for anyone who appreciates a good cup of tea. Approximate dimensions of Teapot and Teacup: Teapot holds 7 fluid ounces (207mL). 5.5 inches (14 cm) in length from tip of spout to handle. 3.25 inches (8.5cm) tall. Teacup holds 1.5 fluid ounces (40mL). 2.25 inches (6cm) in diameter. 1.25 inches (3cm) tall. Dimensional shipping weight of set is 9 lbs.